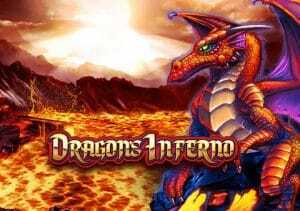 Fire breathing reptiles and heroic medieval knights are the stars of Dragon’s Inferno, a volatile fantasy themed video slot from WMS. Played using a 5 reel, 30 payline game engine, it comes with replicating wilds as well as a bonus feature that awards up to 80 free spins with all wins doubled. Play from between 30p and £90 per spin. The imagery in Dragon’s Inferno has a strong swords and sorcery feel – joining the lower value playing card suit symbols are a range of potions, crystal balls, swords and books of spells. More lucrative still are a bow and arrow wielding archer, a female magician and a knight in armour. The treasure chest is the most rewarding symbol, offering 500 times your line bet if you land 5 in a row. There are 2 wild symbols – the standard wild appears on reels 1, 2, 4 and 5 and replaces everything bar the feature scatter. There’s also the dragon which hits on reel 3 only when – when it lands and forms part of a winning combination, it will trigger the Replicating Wild feature. Here the dragon will transform a random number of symbols wild. A new payout is made with the new wilds in position. You can usually expect around 5 bonus wilds which can make it a potentially rewarding extra. The other extra also offers plenty of potential – land 3, 4 or 5 feature symbols and you can look forward to 10, 20 or 40 free spins. These spins are played out on a new set of reels. More importantly, they all come with a 2x multiplier with all payouts doubled. You can trigger more free spins if the feature symbols fall nicely. The replicating wilds are also in play during the feature too. Dragon’s Inferno has a fiery theme and that goes for the volatility too as this is a high variance affair. Expect lengthy spells when the dragons will set fire to your bankroll. Combine the replicating wilds with the free spins and a multiplier and it’s possible to fly off with impressive hauls of coins. This isn’t the most spectacularly designed slot you’ll come across. The sound and imagery are typical of a WMS live slot conversion. If you look past the basic visuals, there’s plenty to get stuck into here. If you like volatile, fast-paced action, these dragons deliver. I also recommend WMS’ Viking Vanguard which has a similar feel but is more volatile and better graphically.